The Data Genomics Index is a first-of-its-kind benchmark analysis of data stored within a typical enterprise environment. This report reveals insights into data growth, data age, and data type thereby providing organizations with the comparison standard for beginning to take action on their data. 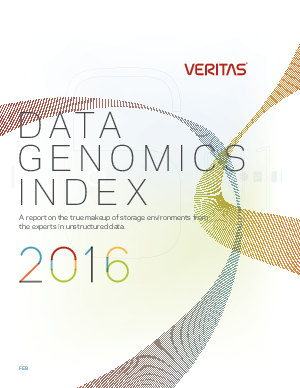 In addition to the Index, Veritas has founded the Data Genomics Project. This community of likeminded data scientists, industry experts and thought leaders will come together to surface the true nature of enterprise environments, build the data-genome that matters for information management, and share the discussion with a world struggling to solve tremendous data growth challenges.